Cuthbert Collingwood is Northumberland’s greatest – and perhaps least known – hero. He was born in Newcastle in 1748, went to sea at the age of 13, and became one of the most important commanders on land or sea in the wars against Napoleon. Though he loved Northumberland he spent just five of the next 48 years at home. He fought in some of the greatest naval engagements of any age and took on the mantle of Commander in Chief of the Mediterranean Fleet after Nelson’s death at Trafalgar. He was Nelson’s bosom friend and hero; he was a brilliant seaman, gunner and strategist. He held very modern views on education and leadership and hated flogging. He was humane and caring, a devoted family man, and his wit and perspicacity ring out across the generations. Above all, he should be remembered and honoured for sacrificing his life and happiness for his country. 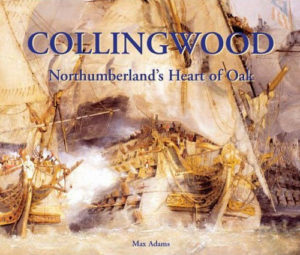 Collingwood: Northumberland’s Heart of Oak, tells the story of Collingwood’s adventurous life, from youthful scrapes to his heroic actions at the battle of Trafalgar. It was published in 2005, the Year of the Sea and bicentenary of the Battle of Trafalgar, by Tyne Bridge Publishing.